IJCAR 2014 invites submissions related to all aspects of automated reasoning, including foundations, implementations, and applications. Original research papers and descriptions of working automated deduction systems are solicited. The proceedings of IJCAR 2014 will be published by Springer-Verlag in the LNAI/LNCS series. Robert L. Constable was presented the 2014 Herbrand Award in recognition of his pioneering research in automated reasoning, such as his seminal contributions to the foundations of computational type theory; the creation of Nuprl, the first constructive type theory based theorem prover; the development of the correct-by-construction programming paradigm; and their applications to verification and synthesis of computer systems, including distributed computing. The best paper award was given to Aleksandar Zelji&cacute;, Christoph M. Wintersteiger, and Philipp Rümmer for their paper Approximations for Model Construction. The paper presents a new way to integrate approximation techniques into automated reasoning procedures and proves its usefulness for the important case of floating-point arithmetic. The paper was selected by the IJCAR 2014 Program Committee. All submissions were made electronically via EasyChair. Submission is now closed. Authors are strongly encouraged to use LaTeX and the Springer “llncs” format, which can be obtained from here. The page limit is 15 pages for full papers, and 7 pages for system descriptions. 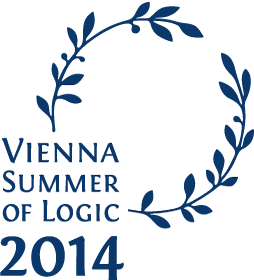 Other speakers during the second week of the Vienna Summer for Logic include (in alphabetical order) Franz Baader, Edmund Clarke, Veronique Cortier, Orna Kupferman, Christos Papadimitriou, and Alex Wilkie. 76 workshops have been accepted to FLoC 2014, and a number are affiliated to IJCAR. The full list of workshops is available on the VSL site. FLoC travel awards are available to enable selected students to attend the conference. See the FLoC travel support page for details. Please note the application deadline is June 8, so act quickly.